Updated Sep. 10, 2015 12:58 p.m.
USC Annenberg today announced that Monica Castillo has been selected as the school’s first Sony Pictures Entertainment Fellow. Castillo was awarded a scholarship from Sony Pictures Entertainment (SPE) that she will use to study film criticism as part of USC Annenberg’s Masters in Arts Journalism program. 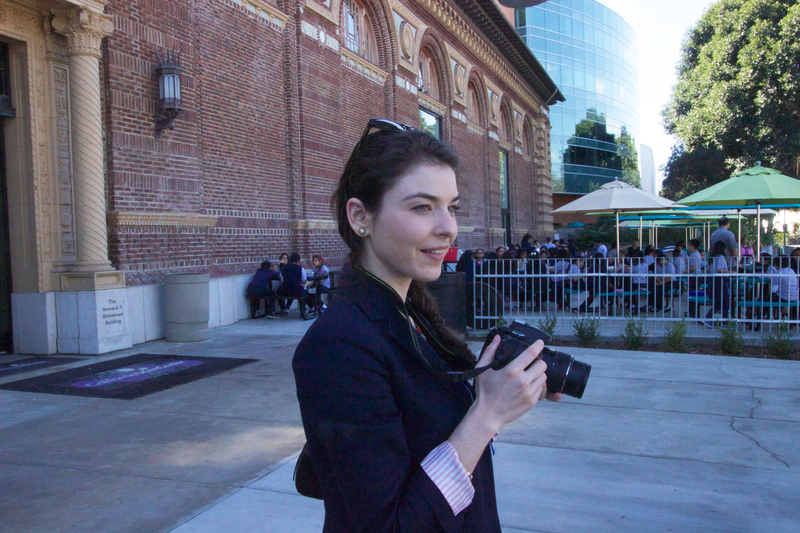 Monica Castillo won the Sony Pictures Fellowship, a scholarship to study film criticism. Photo courtesy of Stephanie Ramones. A joint venture between USC Annenberg and SPE, the fellowship is the university’s first program specifically designed for film critics. Castillo will take classes at both USC Annenberg and the USC School of Cinematic Arts. She will be mentored by Los Angeles Times critic Kenneth Turan and also advised by Sasha Anawalt, director of the Masters in Arts Journalism program. Turan, who is also an adjunct professor at Annenberg, salutes USC and SPE’s investment in the future of film criticism. “It’s a kind of recognition of the ongoing importance of film criticism that I think is very commendable,” he said. Castillo, 25, is a self-taught film critic, who found her passion for film criticism while studying molecular biology and biochemistry at Boston University. She covered films for her college paper and co-founded the Boston Online Film Critics Association. She is currently a Brooklyn-based entertainment reporter for International Business Times. For over five years, she has also worked as a freelance film critic. A first-generation Cuban-American, raised in Tampa, Florida, Castillo said her perspective as a Latina woman offers audiences a different viewpoint. “It’s part of who I am. It’s how I relate to things. It’s how I watch media. It’s how I am able to criticize it, sometimes,” said Castillo. She said that she can be more sensitive to a character being stereotyped than other critics. After years of learning the hard way, without formal film study, Castillo is looking forward to learning from her new mentors at USC. “I’m very excited just to listen and learn,” she said. Top photo courtesy of Creative Commons/charamelody.